Nature tells us that hiding in plain sight can, at times, be a species’ best defense. 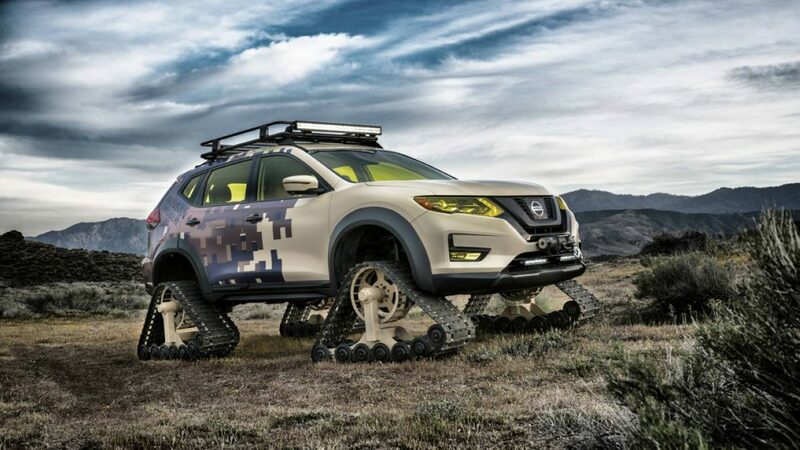 For the new Nissan Rogue Warrior Trail Project, camouflage is likely not enough – especially while hiding in the Nissan display at the 2017 New York International Auto Show, April 14 through 23 at the Jacob Javits Convention Center. 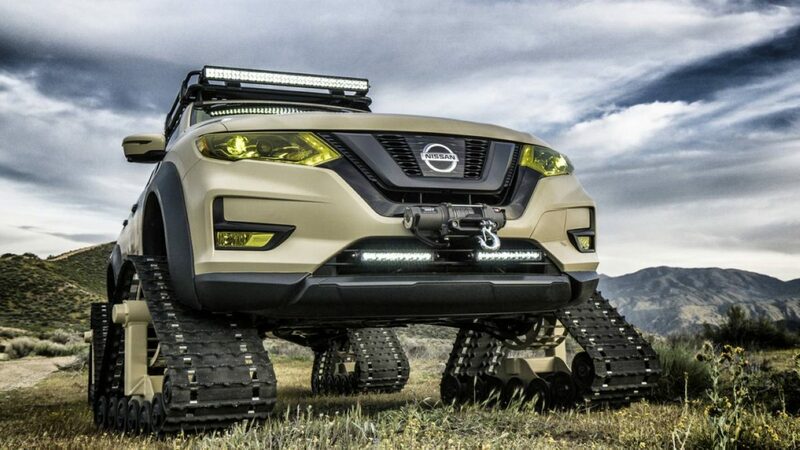 The special one-off project vehicle is one of several unique takes on Nissan’s best-selling Rogue crossover created exclusively for the New York show. Two features dominate the appearance of the Rogue Trail Warrior. 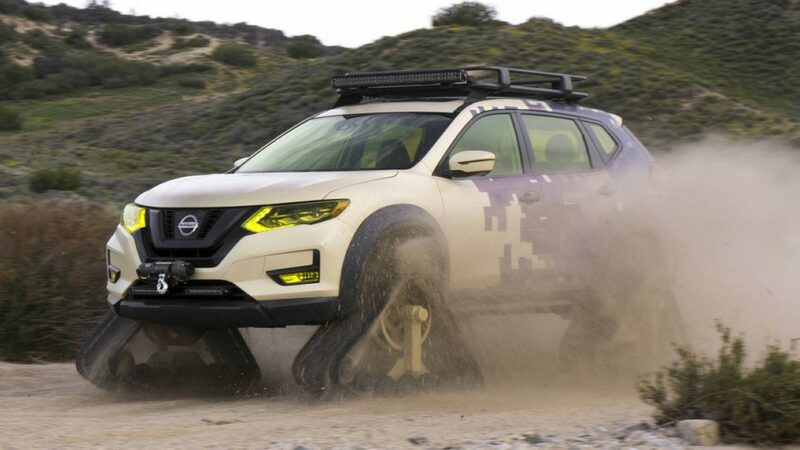 First, the exterior design treatment that combines a custom camouflage body wrap, khaki-painted tracks system and military-style yellow glassworks. And then there are the snow/sand tracks. The DOMINATOR® Tracks, from American Track Truck, Inc., are 48 inches long, 30 inches high and 15 inches wide, and they replace the Rogue’s regular wheels and tires. The suspension and wheel wells were modified to fit the track system, but otherwise all drivetrain components, including the 2.5-litre DOHC 16-valve inline 4-cylinder Rogue powerplant and Xtronic transmission, are standard factory issue. The engine is rated at 170 horsepower and 175 lb-ft of torque, more than enough for climbing snow banks or sand dunes. Filling out the Rogue Trail Warrior adventure equipment list are tinted headlights, custom fender flares, ARB Gear Basket, LED lights and a Warn 4K winch. 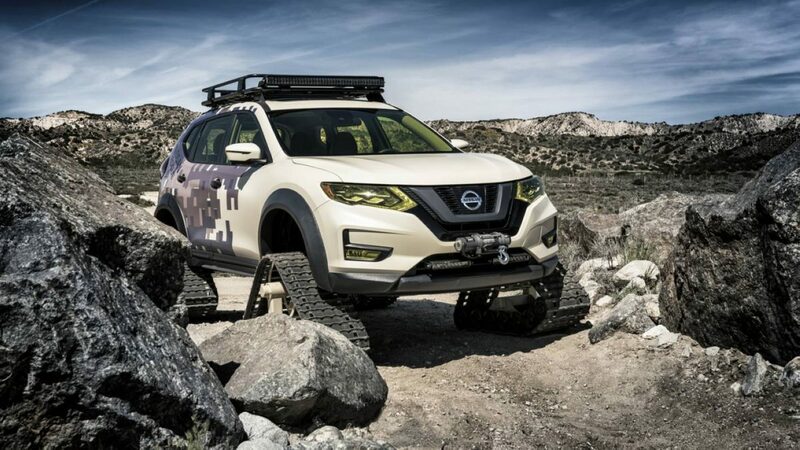 The Nissan Rogue, following three straight years of sales growth since the introduction of the completely redesigned second generation for the 2014 model year, takes another major step forward for 2017 with a new look, enhanced utility and an expanded suite of available Nissan Safety Shield technologies. 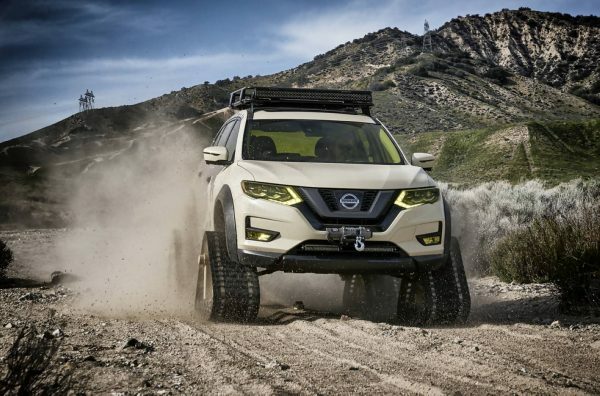 Rogue is now Nissan’s top-selling vehicle. In an expansion of the Rogue lineup, a new petrol-electric hybrid powertrain – available in two grade levels and a choice of front-wheel or all-wheel drive – is offered for the first time in Rogue history. A new Rogue Sport model – which is slightly smaller, sportier and more affordable than Rogue and designed for younger, urban SUV buyers – goes on sale at Nissan dealers nationwide (USA) in spring 2017.